Receive a $100.00 rebate* with the purchase of your next Mahindra tractor or Mahindra UTV. 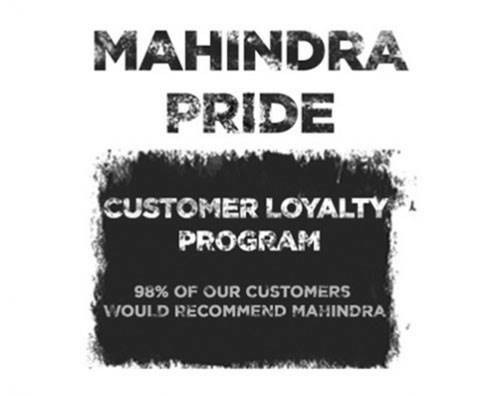 This offer is available to returning Mahindra customers on either a tractor or utility vehicle. Offer in U.S. Dollars. PURCHASE: Purchase your next new Mahindra tractor or Mahindra UTV and receive a cash rebate of $100.00. Serial numbers for both the newly purchased tractor or UTV and the previously owned/original tractor must be provided. Proof–of–Purchase invoice must clearly indicate the purchase date, dealer name, address, model and description of the Mahindra tractor or Mahindra UTV and retail price of each. The Mahindra brand must be CLEARLY indicated on the dealer invoice for the qualifying tractor or UTV purchase. Trading or selling proof-of-purchase is strictly prohibited.